Information about Minnesota Wildlife Art Galleries from ArtBarbarians.com located in Minnesota. When looking for just the right print for your home or office, doesn't it make sense to deal with people who are experts at it? It seems a Minnesota wildlife art gallery should be true to their calling and not get people confused when looking for wildlife art for their home or office. When it comes to making an artistic statement in your home or office, why not do something different that will give people a sense of a fine art print? 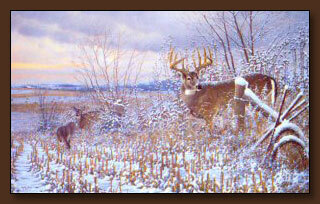 We're different than a frame shop, we sell wildlife art and are passionate about it. Many of today's best wildlife artists come from Minnesota, where the land influences people deeply. There's nothing quite like a natural scene to evoke a sense of serenity and restore a calming effect to your soul. It can be yours with a wide selection of artists that we not only sell, but also call our friends. When we exhibit wildlife artists, we aren't so much about selling a painting as we are helping you bring some of the beauty of our native land into your interior spaces. Imagine a group of ducks coming into a stormy lake or the wary look of deer looking for food in mid-winter. You don't have to imagine it as we have prints from many famous artists, the best in their genre, bringing this into your home or office interiors. There are so many ways to incorporate these fine art pieces into your interior design and we can help you find just what you're looking for. Right now, we have wonderful wildlife prints from many artists and we would like suggest an artist we think you'll really like, she's part of our top ten. Bonnie Latham is considered to be a rising star in this art form. Inspired by her family and their love of the outdoors, she paints nature, landscape, animals, birds, and the occasional portrait. She works in watercolor, oil, inks, graphite/charcoal and others, however acrylics & watercolors have become her mediums of choice. Bonnie won the Federal Junior Duck Stamp competition for 2000-2001 and has been honored in Washington, DC both in June, 2000 for the first day of sale and stamp signing ceremony and the awards presentation in November, 2000. Bonnie has entered the Minnesota Junior Duck Stamp Competition 5 times, winning a second place and 2 first places as well as the Best of Show. Call us if you have any questions about anything you see on our web site. If you're local to the Minnesota or Wisconsin area, we invite to visit us, you'll see the difference when you walk in the door. Our offering is stunning and we'll be happy to answer your questions personally regarding availability or something special you're looking for.